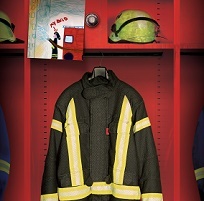 DuPont Protection Technologies presents its leading DuPont™ Nomex® heat and flame protection, DuPont™ Tyvek® and DuPont™ Tychem® chemical and biological apparel offer for the emergency response services at Interschutz 2015. Exhibiting in Hall 12, Stand E37, DuPont will also be conducting garment burn demonstrations using DuPont™ Thermo-Man® at the outdoor demonstration site. With a global reputation for innovation and development in heat and flame protection for professional and voluntary firefighters, DuPont Protection Technologies has announced the launch of its new Nomex® 3DP outershell fabric (pictured). This builds on over 40 years successfully keeping firefighters safe and completes the DuPont™ Nomex® portfolio. DuPont™ Nomex® 3DP fabric is made up of two layers, using an intelligent weaving structure. This patented Flux Technology consists of an inner layer of DuPont™ Kevlar® and an outer layer of DuPont™ Nomex®. With different thermal shrinkage patterns, each layer reacts differently to heat flux, triggering increased levels of insulation. When a heat flux hits the outer layer of Nomex® the fibre reacts and thickens to increase the insulation barrier while the inner layer of Kevlar® offers high mechanical strength, providing three-dimensional protection and giving extra seconds of wearer safety. This weaving structure also provides a garment that is breathable, comfortable and flexible, while optimising durability and mechanical strength to enable longer wear-life and lower repair and replacement costs. A range of Tyvek® and Tychem® protective apparel will also be presented on the DuPont stand. These products are ideal for rescue and fire brigades that may be required to attend environmental clean-ups or disaster relief situations. Tyvek® and Tychem® chemical protection apparel complies with Category 3 and each model is certified as meeting the requirements of Types 3-6 as well as partly meeting those of EN 14126, Types 3-B and 4-B, depending on the material and purpose. Tyvek® and Tychem® apparel is also extremely lightweight, can be put on and taken off quickly and easily and offers good freedom of movement. This offers a cost-effective alternative to conventional chemical protection apparel, which tends to be heavier. The latest top-of-the-range Nomex® fire protection apparel from DuPont Protection Technologies will be put to the test at Interschutz with burns on Thermo-Man®. These will be conducted in DuPont’s own self-contained unit, situated outside in the exhibition grounds. Firefighters will have the opportunity to see garments made from the recently launched DuPont™ Nomex® 3DP fabric tested in action, in addition to a dedicated burn test on the new Tychem® ThermoPro coverall. DuPont also plans to showcase a series of innovative gloves made by their key partners with Kevlar® fibre. These gloves guarantee robustness against cold, heat and sharp edges without losing comfort and dexterity. They are primarily targeted for firefighters, law enforcement and rescuers who deserve optimal hand protection.